Apple has released MacOS 10.14.2 update for MacOS Mojave. 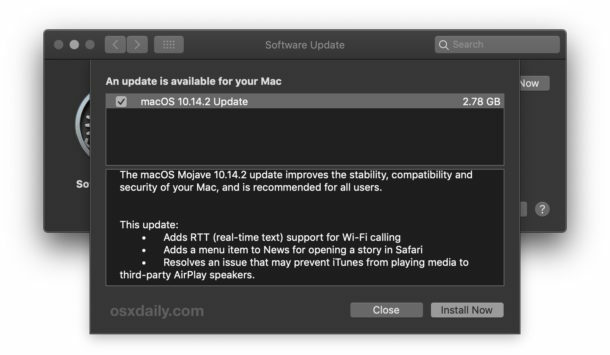 The latest software update for the Mac is said to improve the stability, compatibility, and security of Macs, and is therefore recommended for all Mojave users to install. Mac users not running Mojave will instead find “Security Update 2018-003 High Sierra” and “Security Update 2018-006 Sierra” available for prior MacOS versions, along with updates to the Safari web browser. Separately, Apple also released iOS 12.1.1 update for iPhone and iPad, along with an update to tvOS for Apple TV, an update for Homepod, and a small update to iTunes for Windows, along with watchOS 5.1.2 for Apple Watch with ECG and health features. Be sure to backup the Mac before installing any system software update, backing up with Time Machine is easy and strongly recommended. The update to Mojave is over 2 GB, and the Mac will reboot to complete the installation of macOS 10.14.2. Installing the update can take longer than expected in some cases, so be patient. Earlier versions of MacOS prior to Mojave will instead find “Security Update 2018-003 High Sierra” and “Security Update 2018-006 Sierra” available from the Mac App Store “Updates” section. Separately, Mac users can also choose to download the MacOS 10.14.2 update directly from Apple, either as a standard update or as a combo update, or download the security updates for Sierra and High Sierra. Most Mac users should simply update through the Software Update mechanisms on their Macs, though using a Combo Update with Mac OS is helpful if you’re updating from an earlier version of Mojave (eg from 10.14 directly to 10.14.2, skipping the .1 release), and running the combo update can also be helpful for troubleshooting a failed MacOS software update process. MacOS Mojave 10.14.2 update improves the stability, compatibility, and security of your Mac, and is recommended for all users. Presumably a wide variety of bugs and other issues have been addressed, even if they’re not specified in the release notes. It’s possible that 10.14.2 may help with some user reported difficulties that are not mentioned in the release notes, for example some reports of battery drain, or wi-fi issues with MacOS Mojave, though for most users any wi-fi problems are easily resolved by setting up new network locations after removing old preference files, a process which is entirely separate from software updates. Nonetheless it’s good practice to install system software updates when available. Separately, Apple also released iOS 12.1.1 update for iPhone and iPad along with an update to tvOS for Apple TV, and to HomePod. Even today, the most stable & reliable macOS is Yosemite! It definitely is if you have an older Mac, then Mountain Lion is the next best option I think. My 2008 iMac died tho. :-( Sierra isn’t that bad. Be grateful of anyone can tell me if I can upgrade/update from Yosemite to Mojave? What if I just want to upgrade to High Sierra.. is it still available? My machine is a late 2012 iMac. I seem to get to install Mojave every week on one of the 4 macs. Even wiped on and did a clean install, next reboot black screen with the Apple. The old 17″ on High Sierra keeps rolling along. How long does it take for the files to show in the Update panel? I checked today and there are no updates available for my 10.14.1. What about an update for v10.11.6 on my MacBook Pro, or is my Mac now obsolete? I would find it most distressing if Apple were to use “Built-in obsolescence” in a product costing well over £1000! Update your MacBook Pro to Mojave and you’ll have access to 10.14.2. It’s an update to Mojave 10.14 not 10.11. What model year is your MacBook Pro? Assuming compatibility, whether or not you decide to run Mac OS Mojave or Mac OS El Capitan is up to you. For many it is personal preference, or down to app use. Apple won’t let me update my v10.11.6 MacBook Pro! Go to the Apple menu and choose ‘ABOUT THIS MAC’, that will tell you what model year your MacBook Pro is. You can then compare that to Mojave compatibility. 10.11.x is the system software version for El Capitan, whereas 10.14.x is for Mojave. You can update from El Capitan to Mojave, if the Mac is compatible with Mojave. Or are you saying your Mac is old and won’t support the new version? Yes my Mac Mid 2009 may be considered old, but for a laptop costing £1749, I may be being naive in expecting it to last! I think that is quite good! Your Mac has lasted a decade so far, and you’re still using it today, is that not lasting long? Depreciate that cost over a decade and it’s a few hundred a year, for technology where things change quickly that’s really quite good! Most people were still using flip phones or didn’t even have a cell phone a decade ago! And you’re still running a stable modern OS with El Capitan, even if it’s not Mojave (speaking my own opinion here but if it works for you that’s all that matters, almost nobody needs the latest bells and whistles with software updates that often seem to slow things down more than improve anything anyway). I understand your complaint sentiment, but it’s a decade old Mac, and you’re still using it now with no problems. I have a newer Mac from 2015 that I still use El Capitan on myself, it’s fast and works well for me so I am not going to clog it up with Mojave or another update. I learned there’s an old saying, no need to fix what isn’t broken! My BMW I bought brand new for $80k USD 5 years ago does not receive and support the latest software from BMW. Furthermore, since it is out of warranty, it has cost me more money out of pocket for parts and labor. I’m not sure it will last as long as your Mac Mid 2009. Be glad BMW isn’t making computers. I know, they dropped several of the services that I bought with the car, before the car was paid off. They stopped doing the report-airbag-deployment at the same time they had air-bags spontaneously going off. Interesting, there are mixed reports of some Mac users having problems getting Mojave 10.14.2 to download and install, I wonder what is going on? BACKUP YOUR MAC before using it or installing the update. If the update download is causing a problem…. hopefully it’s not a sign of things to come for installing the update… but backup first just to be sure. Better safe than sorry. Worked like a charm, Davis! Thanks. I owe you one. 2018 MacBook Air Retina, installed macOS 10.14.2 update and now the screen has some graphical glitches and graphic glitching, weird artifacts and blinking on the display, especially in background windows. Like little blinking elements, almost like pixels are turning off and on. Very strange. Will reboot, SMC/nvram reset, etc, to investigate further. Also noticed that the screen sometimes flickers with brightness set to maximum level, not sure why that is. This is a newest Mac product with the newest Mac system software…. Sigh. I had a horrific Mojave install experience. I was using High Sierra on a 2016 Macbook Pro. Safari broke after the recent security update so I figured it was time to go all in with Mojave. Well that didn’t go well. It installed, but the computer started crawling. 1-2 minutes to open an app, with a lot of drive activity on the crash reporter as seen through activity monitor. My guess is that the OS was working back and forth between the SSD and no resources were given to other applications including the finder. Worse yet, it could not located any of my network hardware. No Wifi, no USB ethernet. I tried to reinstall via the recovery partition after doing a Disk Utility scan and repair just to make sure that wasn’t the issue. Ended up recovering a working time machine image that was stored before the security update that started problems. Everything is working as it should now, so it was definitely a software problem courtesy of apple. I’ll wait a bit longer before I update and possibly use an external USB combo install if I really need to do this. May not. It’s highly recommend, my 2017 Mac battery life improves a lot compare to previous version. Another highlight is it actually less lagging than previous version of Mojave.